For the genus of lice, see Ricinus (insect). 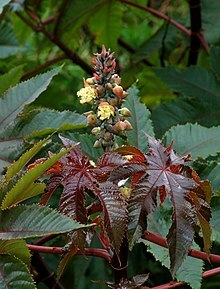 Ricinus communis, the castor bean or castor oil plant, is a species of perennial flowering plant in the spurge family, Euphorbiaceae. It is the sole species in the monotypic genus, Ricinus, and subtribe, Ricininae. The evolution of castor and its relation to other species are currently being studied using modern genetic tools. It reproduces with a mixed pollination system which favors selfing by geitonogamy but at the same time can be an out-crosser by anemophily (wind pollination) or entomophily (insect pollination). Castor seed is the source of castor oil, which has a wide variety of uses. The seeds contain between 40% and 60% oil that is rich in triglycerides, mainly ricinolein. The seed also contains ricin, a water-soluble toxin, which is also present in lower concentrations throughout the plant. An unrelated plant species, Fatsia japonica (false castor oil plant), is similar in appearance but is from Japan. The name Ricinus is a Latin word for tick; the seed is so named because it has markings and a bump at the end that resemble certain ticks. The genus Ricinus  also exists in zoology, and designates insects (not ticks) which are parasites of birds; this is possible because the names of animals and plants are governed by different nomenclature codes. The common name "castor oil" probably comes from its use as a replacement for castoreum, a perfume base made from the dried perineal glands of the beaver (castor in Latin). It has another common name, palm of Christ, or Palma Christi, that derives from castor oil's reputed ability to heal wounds and cure ailments. Ricinus communis can vary greatly in its growth habit and appearance. The variability has been increased by breeders who have selected a range of cultivars for leaf and flower colours, and for oil production. It is a fast-growing, suckering shrub that can reach the size of a small tree, around 12 m (39 ft), but it is not cold hardy. The glossy leaves are 15–45 cm (5.9–17.7 in) long, long-stalked, alternate and palmate with five to twelve deep lobes with coarsely toothed segments. In some varieties they start off dark reddish purple or bronze when young, gradually changing to a dark green, sometimes with a reddish tinge, as they mature. The leaves of some other varieties are green practically from the start, whereas in yet others a pigment masks the green color of all the chlorophyll-bearing parts, leaves, stems and young fruit, so that they remain a dramatic purple-to-reddish-brown throughout the life of the plant. Plants with the dark leaves can be found growing next to those with green leaves, so there is most likely only a single gene controlling the production of the pigment in some varieties. The stems and the spherical, spiny seed capsules also vary in pigmentation. The fruit capsules of some varieties are more showy than the flowers. The flowers lack petals and are unisexual (male and female) where both types are borne on the same plant (monoecious) in terminal panicle-like inflorescences of green or, in some varieties, shades of red. The male flowers are numerous, yellowish-green with prominent creamy stamens; the female flowers, borne at the tips of the spikes, lie within the immature spiny capsules, are relatively few in number and have prominent red stigmas. The fruit is a spiny, greenish (to reddish-purple) capsule containing large, oval, shiny, bean-like, highly poisonous seeds with variable brownish mottling. Castor seeds have a warty appendage called the caruncle, which is a type of elaiosome. The caruncle promotes the dispersal of the seed by ants (myrmecochory). Castor oil has many uses in medicine and other applications. An alcoholic extract of the leaf was shown, in lab rats, to protect the liver from damage from certain poisons. Methanolic extracts of the leaves of Ricinus communis were used in antimicrobial testing against eight pathogenic bacteria in rats and showed antimicrobial properties. The pericarp of Ricinus showed central nervous system effects in mice at low doses. At high doses mice quickly died. A water extract of the root bark showed analgesic activity in rats. Antihistamine and anti-inflammatory properties were found in ethanolic extract of Ricinus communis root bark. Extract of Ricinus communis exhibited acaricidal and insecticidal activities against the adult of Haemaphysalis bispinosa Neumann (Acarina: Ixodidae) and hematophagous fly Hippobosca maculata Leach (Diptera: Hippoboscidae). The Bodo tribals of Bodoland in Assam, India, use the leaves of this plant to feed and rear the larvae of muga and endi silkworms. Castor oil is an effective motor lubricant and has been used in internal combustion engines, including those of World War I airplanes, some racing cars and some model airplanes. It has historically been popular for lubricating two-stroke engines due to high resistance to heat compared to petroleum-based oils. It does not mix well with petroleum products, particularly at low temperatures, but mixes better with the methanol based fuels used in glow model engines. In total-loss-lubrication applications, it tends to leave carbon deposits and varnish within the engine. It has been largely replaced by synthetic oils that are more stable and less toxic. Jewelry is often made of castor beans, particularly necklaces and bracelets. 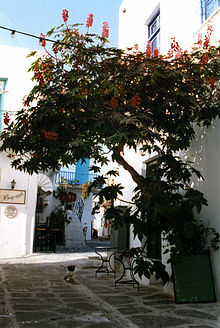 In Greece R. communis is hardy enough to grow as a small tree. In northern countries it is grown instead as an annual. Cotyledons (round) and first true leaves (serrated) on a young plant. This castor oil plant is about four weeks old. Although Ricinus communis is indigenous to the southeastern Mediterranean Basin, Eastern Africa, and India, today it is widespread throughout tropical regions. In areas with a suitable climate, castor establishes itself easily where it can become an invasive plant and can often be found on wasteland. It is also used extensively as a decorative plant in parks and other public areas, particularly as a "dot plant" in traditional bedding schemes. If sown early, under glass, and kept at a temperature of around 20 °C (68 °F) until planted out, the castor oil plant can reach a height of 2–3 metres (6.6–9.8 ft) in a year. In areas prone to frost it is usually shorter, and grown as if it were an annual. However, it can grow well outdoors in cooler climates, at least in southern England, and the leaves do not appear to suffer frost damage in sheltered spots, where it remains evergreen. It was used in Edwardian times in the parks of Toronto, Ontario, Canada. Although not cultivated there, the plant grows wild in Southern California, notably Griffith Park in Los Angeles. Selections have been made by breeders for use as ornamental plants (heights refer to plants grown as annuals) and for commercial production of castor oil. Ricinus communis is the host plant of the common castor butterfly (Ariadne merione), the eri silkmoth (Samia cynthia ricini), and the castor semi-looper moth (Achaea janata). It is also used as a food plant by the larvae of some other species of Lepidoptera, including Hypercompe hambletoni and the nutmeg (Discestra trifolii). Ricinus is extremely allergenic, and has an OPALS allergy scale rating of 10 out of 10. 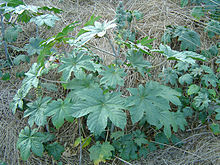 The plant is also a very strong trigger for asthma, and allergies to Ricinus are commonplace and severe. The castor oil plant produces abundant amounts of very light pollen, which easily become airborne and can be inhaled into the lungs, triggering allergic reactions. The sap of the plant causes skin rashes. Individuals who are allergic to the plant can also develop rashes from merely touching the leaves, flowers, or seeds. These individuals can also have cross-allergic reactions to latex sap from the related Hevea brasiliensis plant. The toxicity of raw castor beans is due to the presence of ricin. Although the lethal dose in adults is considered to be four to eight seeds, reports of actual poisoning are relatively rare. According to the Guinness World Records, this is the world's most poisonous common plant. Symptoms of overdosing on ricin, which can include nausea, diarrhea, tachycardia, hypotension and seizures, persist for up to a week. However, the poison can be extracted from castor by concentrating it with a fairly complicated process similar to that used for extracting cyanide from almonds. If ricin is ingested, symptoms may be delayed by up to 36 hours but commonly begin within 2–4 hours. These include a burning sensation in mouth and throat, abdominal pain, purging and bloody diarrhea. Within several days there is severe dehydration, a drop in blood pressure and a decrease in urine. Unless treated, death can be expected to occur within 3–5 days; however, in most cases a full recovery can be made. Poisoning occurs when animals, including humans, ingest broken seeds or break the seed by chewing: intact seeds may pass through the digestive tract without releasing the toxin. The toxin provides the castor oil plant with some degree of natural protection from insect pests such as aphids. Ricin has been investigated for its potential use as an insecticide. The castor oil plant is also the source for undecylenic acid, a natural fungicide. Commercially available cold-pressed castor oil is not toxic to humans in normal doses, either internal or externally. Three terpenoids and a tocopherol-related compound have been found in the aerial parts of Ricinus. Compounds named (3E,7Z,11E)-19-hydroxycasba-3,7,11-trien-5-one, 6α-hydroxy-10β-methoxy-7α,8α-epoxy-5-oxocasbane-20,10-olide, 15α-hydroxylup-20(29)-en-3-one, and (2R,4aR,8aR)-3,4,4a,8a-tetrahydro-4a-hydroxy-2,6,7,8a-tetramethyl-2-(4,8, 12-trimethyltridecyl)-2H-chromene-5,8-dione were isolated from the methanol extracts of Ricinus communis by chromatographic methods. Partitioned h-hexane fraction of Ricinus root methanol extract resulted in enrichment of two triterpenes: lupeol and urs-6-ene-3,16-dione (erandone). Crude methanolic extract, enriched n-hexane fraction and isolates at doses 100 mg/kg p.o. exhibited significant (P < 0.001) anti-inflammatory activity in carrageenan-induced hind paw oedema model. Global castor seed production is around two million tons per year. Leading producing areas are India (with over three-quarters of the global yield), China and Mozambique, and it is widely grown as a crop in Ethiopia. There are several active breeding programmes. Whether natural, blended, or chemically altered, castor oil still has many uses. For example, it remains of commercial importance as a non-freezing, antimicrobial, pressure-resistant lubricant for special purposes, either of latex or metals, or as a lubricating component of fuels. Castor products are sources of various chemical feedstocks. In Brazil, castor oil (locally known as mamona oil) is a raw material for some varieties of biodiesel. In rural areas, the abundant seeds are used by children for slingshot balls, as they have the right weight, size, and hardness. Because castor seeds are attractively patterned, they are popular in low-cost personal adornments, such as non-durable necklaces and bracelets. Castor oil has long been used on the skin to prevent dryness. Either purified or processed, it still is a component of many cosmetics. The high percentage of ricinoleic acid residues in castor oil and its derivatives, inhibits many microbes, whether viral, bacterial or fungal. They accordingly are useful components of many ointments and similar preparations. Castor oil is the major raw material for polyglycerol polyricinoleate, a modifier that improves the flow characteristics of cocoa butter in the manufacture of chocolate bars, and thereby the costs. Castor oil is used in the USA to repel moles and voles for lawn care. Castor seeds have been found in Egyptian tombs dating back to 4000 BC; the slow-burning oil was mostly used to fuel lamps. Herodotus and other Greek travellers noted the use of castor seed oil for lighting, body ointments, and improving hair growth and texture. Cleopatra is reputed to have used it to brighten the whites of her eyes. The Ebers Papyrus is an ancient Egyptian medical treatise believed to date from 1552 BC. Translated in 1872, it describes castor oil as a laxative. The use of castor bean oil (eranda) in India has been documented since 2000 BC in lamps and in local medicine as a laxative, purgative, and cathartic in Unani, Ayurvedic, siddha and other ethnomedical systems. Traditional Ayurvedic and siddha medicine considers castor oil the king of medicinals for curing arthritic diseases. It is regularly given to children orally, for de-worming. "The leaves are applied topically with vinegar for erysipelas, and fresh-gathered, they are used by themselves for diseases of the mamillæ [breasts] and de- fluxions; a decoction of them in wine, with polenta and saffron, is good for inflammations of various kinds. Boiled by themselves, and applied to the face for three successive days, they improve the complexion." In Haiti it is called maskreti, where the plant is turned into a red oil that is then given to newborns as a purgative to cleanse the insides of their first stools. Castor seed and its oil have also been used in China for centuries, mainly prescribed in local medicine for internal use or use in dressings. ^ "Ricinus communis". Natural Resources Conservation Service PLANTS Database. USDA. Retrieved 1 February 2016. ^ "Ricinus communis: Castor oil plant". Oxford University Herbaria. Dept. of Plant Sciences, Oxford. The castor oil plant is one of the few major crops to have an origin in Africa. ^ "Euphorbiaceae (spurge) genomics". Institute for Genome Sciences. University of Maryland Medical School. Retrieved 9 March 2009. ^ Rizzardo, RA; Milfont, MO; Silva, EM; Freitas, BM (December 2012). "Apis mellifera pollination improves agronomic productivity of anemophilous castor bean (Ricinus communis)". Anais da Academia Brasileira de Ciências. 84 (4): 1137–45. doi:10.1590/s0001-37652012005000057. PMID 22990600. ^ a b c d Phillips, Roger; Rix, Martyn (1999). Annuals and Biennials. London: Macmillan. p. 106. ISBN 978-0-333-74889-3. ^ "The Complex Case of Castor's Etymology". Archived from the original on 3 February 2011. ^ a b c Christopher Brickell, ed. (1996). The Royal Horticultural Society A-Z Encyclopedia of Garden Plants. London: Dorling Kindersley. pp. 884–885. ISBN 978-0-7513-0303-2. 4 induced liver necrosis in albino rats". Journal of Ecophysiology and Occupational Health. 4 (3–4): 169–173. ISSN 0972-4397. ^ Sabina E.P. ; Rasool M.K. ; Mathew L.; Parameswari P. (May – August 2009). "Studies on the protective effect of Ricinus communis leaves extract on carbon tetrachloride hepatotoxicity in albino rats". Pharmacologyonline. 2: 905–916. ISSN 1827-8620. ^ Kalaiselvi P.; Anuradha B.; Parameswari C.S. (2003). "Protective effect of Ricinus communis leaf extract against paracetamol-induced hepatotoxicity". Biomedicine. 23 (1–2): 97–105. ^ Lomash V, Parihar SK, Jain NK, Katiyar AK (2010). "Effect of Solanum nigrum and Ricinus communis extracts on histamine and carrageenan-induced inflammation in the chicken skin". Cellular and Molecular Biology (Noisy-le-grand). 56 (Suppl): OL1239–51. PMID 20158977. ^ Zahir AA, Rahuman AA, Bagavan A, et al. (August 2010). "Evaluation of botanical extracts against Haemaphysalis bispinosa Neumann and Hippobosca maculata Leach". Parasitology Research. 107 (3): 585–92. doi:10.1007/s00436-010-1898-7. PMID 20467752. ^ "Growing danger: Toxic plants pose pet threat". 10 June 2009. ^ "RHS Plantfinder - Ricinus communis 'Carmencita'". Retrieved 9 October 2018. ^ "AGM Plants - Ornamental" (PDF). Royal Horticultural Society. July 2017. p. 88. Retrieved 9 October 2018. ^ a b Ogren, Thomas (2015). The Allergy-Fighting Garden. Berkeley, CA: Ten Speed Press. pp. 184–185. ISBN 978-1-60774-491-7. ^ Wedin GP, Neal JS, Everson GW, Krenzelok EP (May 1986). "Castor bean poisoning". Am J Emerg Med. 4 (3): 259–61. doi:10.1016/0735-6757(86)90080-X. PMID 3964368. ^ Guinness World Records 2017. London, UK: Guinness World Records Limited. 2016. p. 43. ^ a b Soto-Blanco B, Sinhorini IL, Gorniak SL, Schumaher-Henrique B (June 2002). "Ricinus communis cake poisoning in a dog". Vet Hum Toxicol. 44 (3): 155–6. PMID 12046967. ^ Irwin R (March 1982). "NTP technical report on the toxicity studies of Castor Oil (CAS No. 8001-79-4) In F344/N Rats And B6C3F1 Mice (Dosed Feed Studies)". Toxic Rep Ser. 12: 1–B5. PMID 12209174. ^ Tan Q.-G.; Cai X.-H.; Dua Z.-Z. ; Luo X.-D. (2009). "Three terpenoids and a tocopherol-related compound from Ricinus communis". Helvetica Chimica Acta. 92 (12): 2762–8. doi:10.1002/hlca.200900105. ^ Srivastava, Pooja; Jyotshna; Gupta, Namita; Kumar Maurya, Anil; Shanker, Karuna (2013). "New anti-inflammatory triterpene from the root of Ricinus communis". Natural Product Research. 28 (5): 306–311. doi:10.1080/14786419.2013.861834. PMID 24279342. ^ R. M. Mortier; S. T. Orszulik (6 December 2012). Chemistry and Technology of Lubricants. Springer. pp. 226–. ISBN 978-1-4615-3272-9. ^ Tunaru, S; Althoff, TF; Nusing, RM; Diener, M; Offermanns, S (2012). "Castor Oil Induces Laxation and Uterus Contraction via Ricinoleic Acid Activating Prostaglandin EP3 Receptors". Proceedings of the National Academy of Sciences of the United States of America. 109 (23): 9179–9184. doi:10.1073/pnas.1201627109. PMC 3384204. PMID 22615395. ^ John Bostock & H.T. Riley (1855). "Pliny, the Natural History Chapter 41. - Castor Oil, 16 Remedies". ^ Pliny the Elder. Natural History. p. Chapter 41, Book 23.41. ^ Quiros-Moran, Dalia, ed. (2009). Guide to Afro-Cuban Herbalism. p. 347. ISBN 9781438980973. Retrieved 5 August 2017. ^ Auvenshine, Martha Ann; Enriquez, Martha Gunther, eds. (1990). Comprehensive Maternity Nursing: Perinatal and Women's Health. p. 122. ISBN 9780867204216. Retrieved 5 August 2017. Everitt, J.H. ; Lonard, R.L. ; Little, C.R. (2007). Weeds in South Texas and Northern Mexico. Lubbock: Texas Tech University Press. ISBN 978-0-89672-614-7.